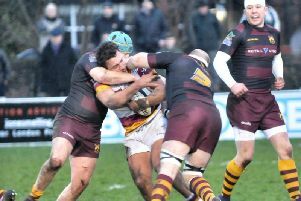 Fylde RFC have lost three more forwards to injury ahead of tomorrow’s crunch clash at home to Huddersfield but head coach Warren Spragg is at least boosted by bringing new players into a winning team. 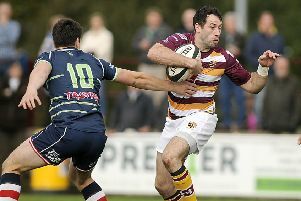 Spragg’s side recorded a fourth successive National Two North victory against Wharfedale at the Woodlands last Saturday but it came at a price, with Adam Joyner dislocating a kneecap and fellow packmen Harlan Corrie and Elliot Horner also forced off during the dramatic 20-17 win. The trio are looking at several weeks on the sidelines, as is key back-rower David Fairbrother,who damaged a shoulder in the victory at Chester a fortnight ago. Spragg told The Gazette: “Adam’s knee is in a brace and I expect he will be out for five or six weeks. But he has been at training this week and is in good spirits. “Fairy is waiting to see another specialist and probably needs surgery. Chris Briers’ knee is not as bad as we feared but he will probably be out for two to three weeks, as will Henry Hadfield, Elliot and Harlan. “Some of those may be back for the Preston game (on December 22), and of course everyone will want to play in that one, but we’ll have to see how they progress. “You go through periods in a season when you have a few injuries but you just have to crack on. Joyner’s injury resulted in a long stoppage in play with just five minutes remaining and Fylde leading 17-10. The teams adopted different approaches during the unscheduled break, with Fylde heading to their changing room and Wharfedale remaining on the pitch. And although the visitors scored an equalising try with barely 60 seconds remaining, there was still time for Fylde’s Greg Smith to kick a winning penalty to delight their coach. Spragg added: “After they scored so close to the end, the typical reaction would have been to concede the game as a draw and feel sorry for ourselves, but it’s good to see that we didn’t do that. “Different teams take a different approach during a long break in play. Wharfedale stayed out and went through a few drills to keep warmed up. We went to the changing rooms and the players chilled out with some music. “You have to trust the players to do what is best for them in that situation. They are the ones who have been scrapping for 75 minutes. “Overall I thought we just had the edge. Both teams were solid defensively but we had a few more scoring opportunities and were more dominant in the lineout.